My 7 month old daughter is currently in the stage where she likes to pull off or get her socks off anywhere and everywhere...especially in the cold, winter weather! I am so tired of putting little baby socks on every two minutes or searching for a missing sock! That is why I am so excited to introduce a new and unique baby/toddler shoe line called Bubysums. It is a hybrid design combining the soft flexibility of a performance sock and the protection and stability of a genuine leather soft sole shoe. These shoes are machine-washable, and built to maximize comfort and durability. Parents love Bubysums because they are super cute and easy to put on. Toddlers love Bubysums because they are light-weight, foot conforming and have great traction for good balance. This 2-in-1 product makes getting dressed easy and convenient. No more fiddling with tiny socks while your toddler scoots away just as you reach for his heavy uncomfortable shoes that he is more than likely to pull off within 5 minutes. Bubysums shoe socks consist of a medium to light weight performance sock attached to a genuine suede leather soft sole with gripper dots to help avoid slipping. The sides and toe guard are soft but durable genuine leather. 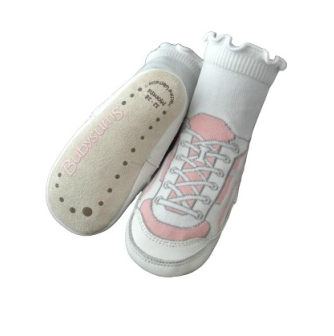 Bubysums shoe sock is light weight, so kids don’t try to pull them off, skid resistant & machine washable. Fits as well as a sock with the protection of a shoe. The sole is made of genuine suede leather with 1/8" padding for a little comfort. This sole is soft and flexible to help your childs feet develop naturally. The sides & toe are soft but durable genuine leather. The sock is made from Performance Nylon/Spandex for a soft feel with great stretch. I received the smallest size for my 7 month old daughter (who is tiny!) and they were a little big still. The only thing I wish for is that they would offer other "girl" colors besides pink! Buy It: You can purchase Bubysums for $24.99 per pair on the Bubysums website. Win It: Bubysums is generously offering (1) pair of your choice to a lucky winner!